In an insider’s account of work at Arthur Andersen, former Sun Valley homeowner Larry Katzen defends the giant accounting firm associated with the Enron scandal of the early 2000s. Katzen, a former partner with the firm, contends that it was unfairly targeted by the U.S. Department of Justice. Arthur Anderson managers allegedly destroyed documents after it learned that it was being investigated by the government. The U.S. Supreme Court overturned the firm’s 2002 conviction when it found that jury instructions were so broad that jurors could have found Arthur Andersen guilty even if staff did not intend to break the law and impede a looming investigation. By then, however, the firm’s reputation had been irrevocably tarnished. Arthur Andersen’s demise resulted in the loss of 28,000 jobs in the United States. Katzen states that Arthur Anderson had no involvement with auditing the two Enron subsidiaries where accounting irregularities were discovered. He also contends that the prosecution was overly broad. He says that the people most hurt by the indictment were lower-level workers, not partners and managers who went on to continue their successful careers. 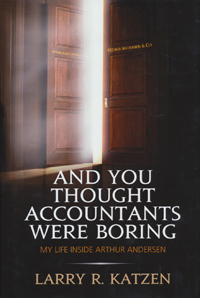 Katzen’s self-published memoir, titled “And You Thought Accountants Were Boring,” is not a detailed account of events during the scandal, but rather a personal story of his 35 years at Arthur Anderson. He worked hard—seven days a week at first—but admired the firm’s integrity and support for its employees. As he rose to partner, his work took him all over the world. Katzen first came to Sun Valley with his family over Christmas 1980. They loved the area so much that by the end of the week they had bought a condo. For the next 13 years, they spent winter and summer vacations here.